The largest living space on Earth lies between the ocean’s sunlit upper layers and the dark floor of the deep sea, on average some 4,000 meters below. This vast midwater habitat is home to our planet’s largest ecosystems and its largest animal communities. Midwater species are adapted to a fluid, three-dimensional world without solid boundaries; and they probably outnumber all other animals on Earth. They comprise essential links in the oceanic food web by providing food for important commercial species like tuna and salmon, as well as for whales, turtles, and giant squid. This is a huge planetary resource, yet we know far less about these species than we do about the constituents of any other major habitat. For more than a century scientists had to study midwater animals indirectly, by towing nets from ships at the surface or by probing the depths with sound. At MBARI, we study midwater animals directly, using undersea vehicles to carry our cameras, instruments, tools and samplers into their deep habitat. This approach, with humans in the real-time control loop, has revolutionized our understanding of midwater ecology and the biology of the animals who live there. 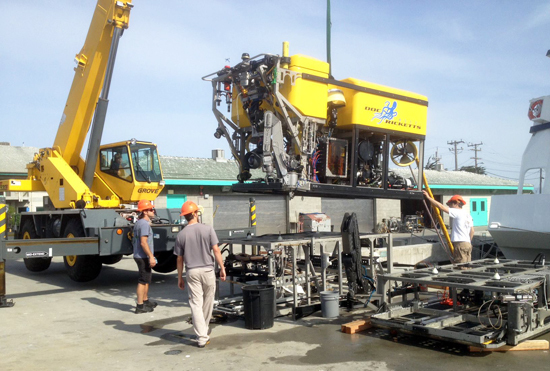 These advances are enabled by new technologies; the hardware, software, and methods developed by MBARI engineers, video technicians, and our operations group. A fundamental aspect of MBARI’s midwater research program is the midwater time series project. For more than 20 years, remotely operated vehicles (ROVs) with high-resolution video cameras have conducted transects through the upper kilometer of the water column at a single site over Monterey Canyon. The data generated by this project includes the identities and abundance of all species encountered, coupled to concurrent measurements of relevant water properties. This is the only data set of its kind in the world and it is immensely valuable by providing a baseline for examining regular seasonal cycling, episodic events like El Niño, and the growing effects of climate change. Ecological investigations encompass a wide range of research projects. One of the most striking aspects of exploring the midwater habitat has been discovering the unexpected profusion and diversity of gelatinous animals. We have documented their diversity, described many new taxa, tracked their ecological niches in the community, and investigated their behavior patterns. An overall goal of these efforts is to accurately trace and quantify the passage of organic carbon from primary production at the surface, through the complexities of the midwater community, to the animals that live on the deep seafloor. 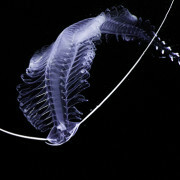 The behavior patterns of deep-sea animals have long been a subject of mystery and speculation. Because of the access provided by MBARI’s ROVs, detailed observations of the behavior of these animals have become possible for the first time. The value of this new kind of information is that it allows a much better understanding of the complex ecological interactions between species. Bioluminescence evolution and chemistry – Understanding the origins, generation, and evolution of bioluminescence is a critical pathway for investigating the most widespread form of communication on Earth. The reward of regular investigations of midwater ecology with an ROV is a radically new perspective on the deep sea. Many of MBARI’s most stunning discoveries have come from the time-series data of midwater ROV surveys. We have logged thousands of hours surveying and describing the deep waters of the ocean. 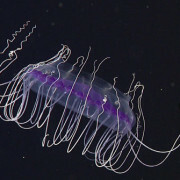 The ocean’s midwater zone is dominated by gelatinous predators such as ctenophores, siphonophores, and hydromedusae. Researchers contend that these gelatinous groups will become increasingly abundant as the ocean changes.